I’m a noob. I’m trying to find a good replacement for JQM. I’m not a great coder. I downloaded Framework7 and created a project with Cordova. I am confused about where I should edit the www files. There are several www folders in Framework7. Should I use the www files in Cordova? Then use the cli “Cordova prepare”? That is how I’ve been updating the iOS and Android files previously. Any links that would help explain this would be appreciated. Your working folder is ‘project folder > www’. Thank you Tsalira. That folder is empty. So, do I just put my index.html file there? Are the other www folders then updated as I change the index.file and add other folders? I’m sorry that my question is so simple, but when I used Cordova with JQM, I had to edit the www folder and then use the CLI to prepare all of the folders. 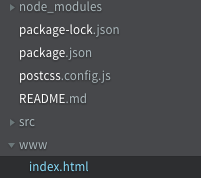 You have to put all your working files in that folder - index.html, css folder, js folder, everything. Thank you guys. I appreciate your help in getting started with F7. I will probably have lots of questions for you later.